To book this journey please complete a Journey Request Form, you will receive an answer from one of our Rail Specialists within 48 hours. For any urgent queries please contact us via phone or email. This route takes you across British Columbia via Kamloops and the Yellowhead Pass. As you travel through BC's vast interior, you'll witness unparalleled natural beauty including Mount Robson, the highest peak in the Canadian Rockies at almost 13,000 feet, and the breathtaking Pyramid Falls. The journey ends in Jasper, Alberta, the largest national park in the Canadian Rockies and also a UNESCO World Heritage Site. The luxury and comfort of Gold-Leaf Service is Rocky Mountaineer's most popular service featuring panoramic views from the custom-designed bi-level GoldLeaf Dome Coach, gourmet hot breakfasts and lunches served in the GoldLeaf Dining Room and complementary alcoholic and non-alcoholic beverages and gourmet snacks available during the day while entertaining and knowledgeable commentary is provided by onboard attendants. Overnight hotel accommodation in Kamploops or Quesnel (guests are requested to pack an overnight bag) and transfers to and from the train are also included. SilverLeaf Service is the new way to experience Rocky Mountaineer's rail journeys into the Canadian Rockies featuring panoramic oversized windows in the single-level dome coach (167% larger viewing area than RedLeaf Service) and reclining dome-level seats which can rotate to accommodate groups of four. Breakfast and lunch are served at your seat with a choice of entrees, a glass of complimentary wine at lunch and complimentary non-alcoholic beverages and snacks served during the day while entertaining and knowledgeable commentary is provided by onboard attendants. Overnight hotel accommodation in Kamploops (guests are requested to pack an overnight bag) and transfers to and from the train are also included. RedLeaf Service offers travel in a single-level classic rail coaches featuring roomy reclining seats, a selection of exceptional chilled breakfasts and lunches served at your seat, a glass of complimentary wine at lunch and complimentary non-alcoholic beverages and snacks served during the day while entertaining and knowledgeable commentary is provided by onboard attendants. 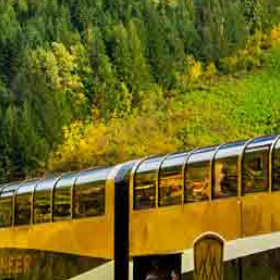 Access the RedLeaf Lounge Car on the Rainforest to Goldrush route, overnight hotel accommodation in Kamloops or Quesnel (guests are requested to pack an overnight bag) and transfers to and from the train are also included. If you would like a quotation for any of the above packages then please complete our journey request form with as much information as possible and one of our agents will be in touch with a detailed quotation, or simply contact us.